Are you curious about Brazilian jiu-jitsu? More and more people are doing jiu-jitsu these days and for good reason. This martial art gets you fit while empowering you with real-life skills. There is no reason to settle for a simple gym where you only get fit when you can learn skills that are actually useful in the outside world! 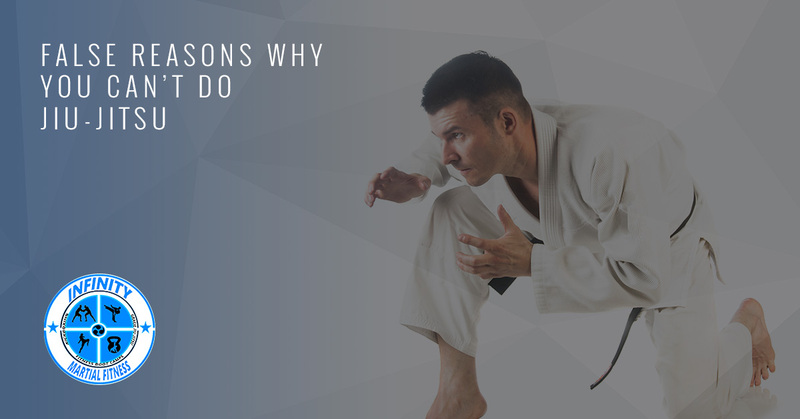 Despite the multitude of benefits that come with training jiu-jitsu, many people find reasons to not do so. At Infinity Martial Fitness, we have heard many different reasons why jiu-jitsu. As it turns out, many of the reasons people stay away from jiu-jitsu are misconceptions. In today’s blog, we want to list some of the most common excuses we hear and clarify why they don’t need to hold you back. People hear how great a workout jiu-jitsu is and immediately anticipate embarrassing themselves in front of the class if they try it. Instead, they decide to get fit before starting to train. Why this is a misconception: The best way to get fit for jiu-jitsu is not by lifting or running; it’s by doing jiu-jitsu! Yes, you’ll probably be exhausted at the end of class, but that is where we all start. That isn’t what matters. What is important is whether you’re on the mats or not. Get on the mats two to three times a week, and you’ll find that you get more comfortable every class. If you’re starting jiu-jitsu, we recommend you focus on eating well, getting enough sleep, and drinking plenty of water. Don’t worry about any additional training. If you work out and train early on, you risk overloading your body and increasing your chances of injury. Many people think they cannot afford to train in jiu-jitsu. If you already struggle with tight finances, spending the little you have to recharge each week on jiu-jitsu can seem like a bad idea. The problem here is that people may not be seeing the big picture. Why budget concerns are a misconception: While jiu-jitsu does cost more than a normal gym membership, you get what you pay for. A jiu-jitsu membership is highly valuable because you benefit from years and years of accumulated knowledge. How much does it really cost? You will usually pay between $50 and $150 per month depending on where you live and how often you want to train. You also will have to spend about $100 on a Gi. Once you have a Gi, it should last you a year or two. The thing that people don’t realize is that, once you start training jiu-jitsu, you spend less money in parts of your life that pull you down, and as a result, your quality of life actually improves. This is because Brazilian jiu-jitsu is a sustainable solution rather than a quick fix. You won’t need as many movies, drinks, or other things that temporarily make you feel better. Because you’ll feel unhealthy food on the mats, you’ll have more reason to eat better foods. Things can only get better. If you see the schedule for a jiu-jitsu academy and feel dismayed because you won’t be able to make all the classes, don’t worry. You aren’t alone. Life is chaotic, and fitting more things into your a hectic schedule can be difficult. It is easy to assume jiu-jitsu simply has no place in your life. Why being too busy is a misconception. You don’t need to attend every class your school offers in order to be successful. Beginners should usually try to attend two to three classes per week. At that rate, you’ll be able to grow and learn at a good rate, allowing your knowledge to build up without being overwhelmed. Start Jiu-Jitsu with Upper Valley! When you find a great jiu-jitsu academy, you’ve found a home away from home. At Infinity Martial Fitness, we are proud to provide Lebanon with a place that is safe, constructive, and great for growing knowledge. Contact us today to learn more!